I have been avoiding YSL Rouge Volupte lipsticks for a while now. The original Rouge Volupte formula has a high dose of SPF, which causes my lips to end the day in the flaky mess, and the Perles rendition was far too gritty in texture for comfortable wear. When I realized the newest incarnation of the lipstick line did not contain SPF, however, I tentatively purchased one shade to test because so many of my viewers and readers requested it. The risk paid off this time, so find out more after the jump! Corail Incandescent is a bright cajun coral, according to Sephora. I had initially planned on purchasing 15 Corail Intuitive after seeing Sabrina's review (HERE), but in the end I settled on the brighter Corail Incandescent because it did not contain any shimmer. The watermelon scent of these lipsticks does fade a couple minutes after application, but some may find the initial whiff too synthetic or too cloying to use. I personally love it. These Rouge Volupté Shine lipsticks are, for the most part, more saturated in pigment than their lipstick-lipbalm hybrid competition, and they are also longer lasting (4 hours + stain). This makes the $34 USD price tag more justifiable. 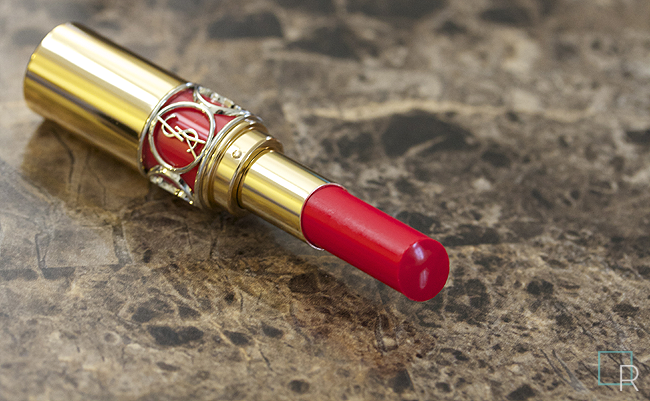 The logo ring around the color band on these Rouge Volupté lipstick bullets is now silver instead of the traditional gold. While this does allow me to more easily differentiate between all the YSL lipsticks in my collection, I do not find it particularly attractive. The mixed metals look suits jewelry better.. white lacquer might have been a more feminine touch. Corail Incandescent is a very easy-to-wear, universal red. It has just enough pink in the base to look flattering on cool-toned skins while there is just enough orange to look flattering on warm-toned skins. On my face, it appears more red since I took the photos indoors with artificial. When I step outside into natural lighting, however, the pink does become more apparent. I love the texture of this particular color because there is no slipping or sliding, and Corail Incandescent actually absorbs into the lips instead of sitting on top of them the way the original Rouge Volupte formula can. It also does not bleed into lip lines the way other semi-sheer reds tend to do. 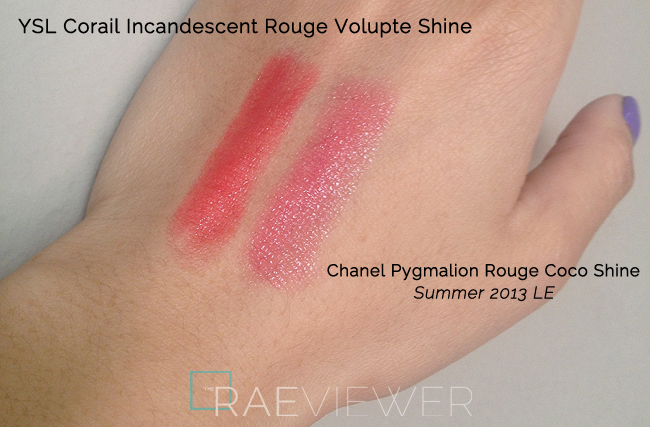 Chanel's Rouge Coco Shines are similar, but they do not apply as smoothly as the Rouge Volupté Shines because of the slightly higher wax content in the RCS. 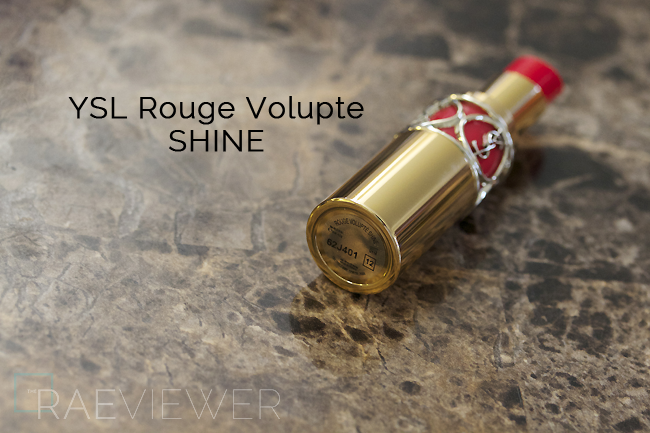 I find that the Rouge Volupté Shine formula feels more creamy and more moisturizing. Corail Incandescent is a coral red that runs more orange in comparison to Pygmalion (swatched above), which is a watermelon flesh colored pink-red. Both shades leave behind pretty, flushed stains after a couple hours of wear, but keep in mind that the lighter shades from each of these lipstick ranges will not perform the same way. Also, the Rouge Coco Shines with shimmer cause my lips to peel terribly, so it will be interesting to see if the YSL Rouge Volupté Shines with shimmer will have the same effect on my sensitive lips. 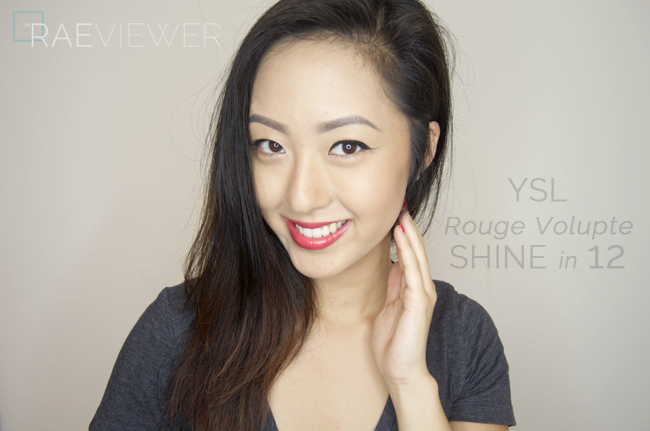 The Rouge Volupte Shine in 12 Corail Incandescent has the staining power of the YSL Glossy Stains (which I reviewed here) without the transformative vinyl finish that some cannot tolerate. The Volupté Shine lipsticks do dry down and lose their glossiness especially after eating or drinking, but they stay true to their lightweight texture during the wear. And last but not least, I do have swatches of a couple pink shades to share with you, thanks to this complimentary tester card that arrived with my last Sephora online order. Please Note: I have yet to try 6, a bright hibiscus pink, or 13, a dried rose pink, on my lips. 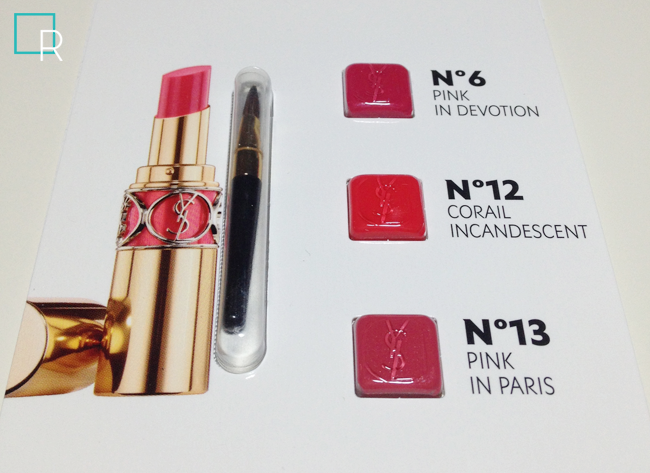 I just opened up the tester card last night, so I will be wearing 13 Pink in Paris to see how it wears today. The above shades were swatched with my fingertips instead of a brush, by the way, so please do forgive the slight patchiness. 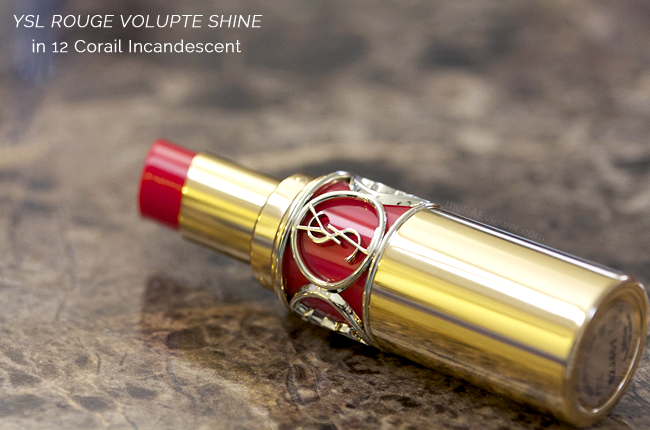 Rest assured, the Rouge Volupté Shine in 12 does apply smoothly and evenly from the bullet. 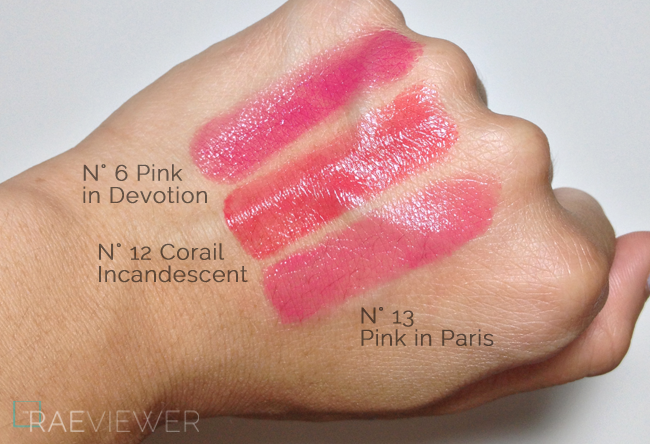 By the look of the swatches, I prefer 13 Pink in Paris because the mauve shimmer is fine.. so fine that I had to examine the swatch to see if there was any shimmer at all. The brighter shade 6 Pink in Devotion is chock-full of fuchsia and blue shimmer, which is not to my taste, so I will not be purchasing this one. 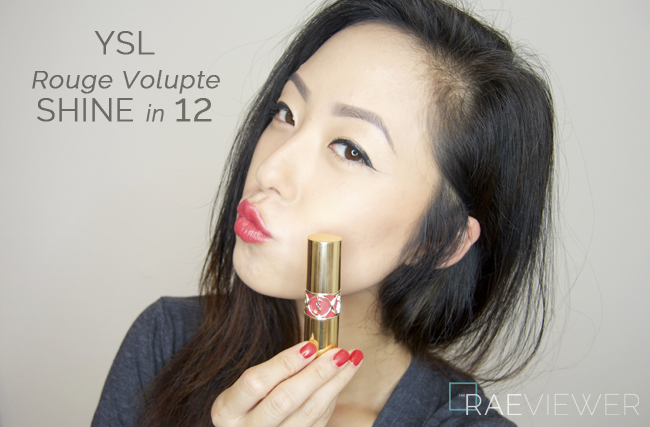 Bottom Line: The Rouge Volupté Shine in 12 Corail Incandescent has managed to restore (albeit temporarily) my faith in the YSL Rouge Volupté range of lipsticks! I bought the exact same colour as my first RVS lipstick! It looks a bit more red on you, really love it! I definitely love this a lot more than Chanel's RCS, those are slightly drying on me and I don't like the scent either. The packaging is so divine! Oh my god I might need that.... 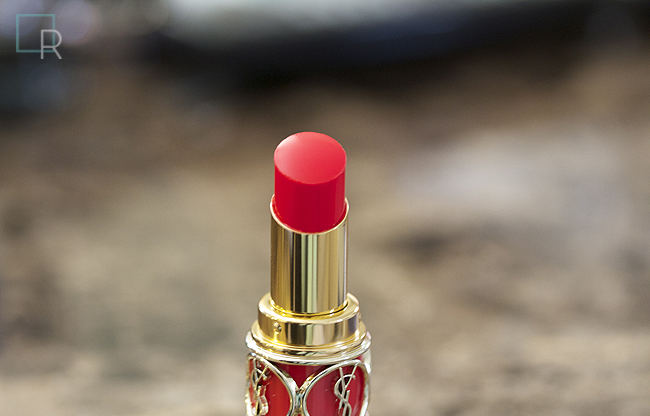 I'm on a lipstick ban at the moment but....... oh god, gimme. REQUEST: could you do a post or video on the best lipstick formulas for flaky lips? My lips peel no matter what lip product I use and I love wearing lip colours (I'm from Australia hence the spelling). So I'd love to know your favourite formulas that don't make your lips peel. Such a pretty, classic colour! Would you possibly consider doing a summary post on products that work well for peeling prone lips? I find a lot of products cause my lips to peel, and as a result I just don't play around with lip products much at all. I think I need Pink in Devotion and Coral Incandescent in my life, they are gorgeous!!! Beautiful colors all around! I love the sample kit! Where can I find the sheet of YSL samples? The color looks beautiful on you! The two other colors are also pretty. I actually bought this color and loved it... then I started to realize I had too many colors just like it so I ended up getting #13 pink in paris which is more wearable everyday. Regardless they're all so pretty and one can never have enough.